Think about your favorite chair for a moment. What is it that you like about it? Is it the color and the shape? Do you like the particular designer? The comfort level? Now let me ask you another question. Why did you not purchase a better chair? That is a silly question, you say. Now think about the chair you are sitting on right now. How well is it designed? Is it optimal? Another silly question. Optimal for what? Optimal is relative, and based upon what it is designed for. Perhaps you are sitting on a poorly designed chair. Poorly designed for what? Again, it depends. Now imagine a little slide show in your head of all the different kinds of chairs in the world. Library chairs with sturdy short legs and bar stools with tall legs. Overstuffed armchairs, and sleek designer conference room chairs. Rattan chairs on porches and lounge chairs on beaches. Wooden pews in cathedrals and artistic chairs in museums. Spinning chairs and bean bag chairs and rocking chairs and lawn chairs. Each chair– designed to fill some particular service. But what does thinking about all these chairs have to do with being an entrepreneur? Form follows function. How something is designed controls how it behaves and performs. You can tell the purpose of a chair just from looking at it. You know before someone sits on it whether it is wholly appropriate for the person who wants to use it–or not. The same is true in business. How your business is designed controls how it behaves and performs. The design of your company helps the customer to intuitively assess whether your business can satisfy their needs before they ever walk in the door. The problem is, many entrepreneurs reverse the axiom. Many small business owners begin business to make money–not to serve a purpose. Without a plan to serve and solve a problem for a specific group of people, they serve no one in particular. They lose connection, and may lose the very lifeblood they need to survive. What if, right from the start, these same entrepreneurs focused all their activities to serve a specific purpose? Now the business performs differently. Now, the business is seen as the answer to a problem. And the marketing would speak directly to the people with the problem–not to anyone and everyone. A business that sustains has lucid purpose. Work in reverse. How would a business with this kind of purpose behave? Design your activity accordingly. How your business is designed from the start will control how it behaves and how it performs, and how well it can connect with its customers. Design your business as if you were designing a chair. Make it the optimal design for a specific purpose. You will find your customers will understand what you do, just from looking at your design. 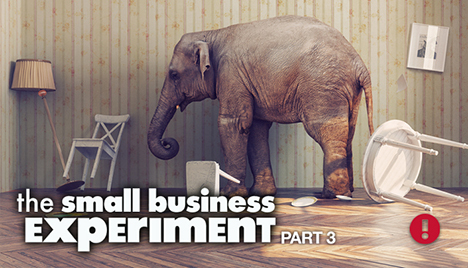 Join us next time for the final installment of The Small Business Experiment! What does Newton’s Third Law of Motion have to do with entrepreneurship? Have you ever seen one of those desk toys called Newton’s Cradle? Definitely for geeks, it holds a half-dozen or so swinging metal balls, suspended by a clear filament from a frame. If you swing the ball on one side of the lineup, the balls in the center remain surprisingly stationary. It is the ball on the other end that receives the transferred energy and swings out in response. It is a demonstration of Newton’s Third Law of Motion, which states that for every action, there is an equal and opposite reaction. The toy represents other things , such as the transfer of authority in any organization. Like the first swinging ball, a CEO will deliver instructions down the chain of command. Unfortunately, she is so far removed from the problems at the other end, that she cannot see how she ever played a part in the blowout. One of the greatest challenges of being an entrepreneur is to see yourself honestly. Why? There is a fine line between strength and weakness. For example, there is a fine line between tenacity and stubbornness. For every strength that has helped you to become successful in the first place, there is an equal and opposite weakness that will undermine your success when the going gets tough. We may understand that we need to delegate those tasks where we are not likely to excel, and it is easy to lean upon the strengths of others in such cases. But what about when we are under pressure? Having a hammer in our hands, we see every problem as a nail. We may default to our strengths whether they apply or not. But when the problem is not the problem, we may end up with bent nails and swollen thumbs. Think about it. A person may have great determination to accomplish their goals. But you may be working hard at the wrong things. Devotion to excellence may make you a craftsman, but perfectionism is the enemy of completion. An entrepreneur may be chock full of ideas, but the only ideas that count are the ones that are completed and shipped. Your best defense against straying over the line in either direction is to have a clear vision of where you are going. Nix any action or attitude that does not advance the troops toward the goal. Vision will keep you from falling off the cart. Everyone needs someone outside the frame to provide objectivity. It is human nature to obsess over skills we do not possess, and we can quickly lose heart. But focus too heavily on your strengths, and you may rely on them too much. Losing heart makes you weary. Be oblivious to your weaknesses and you lose that valuable commodity called humility. Ask a mentor for feedback. You may be surprised that others perceive a weakness as a strength, and a strength as a weakness. Outside perspective can help you distinguish which is which. Becoming an expert at anything does not start with excuses. It starts with overcoming. To become an expert in anything, you must have experience. Are you aware just how many famous people were told that they had no talent at all? Or had no college degrees? Or that they would never make it? So what! Excuses will never help you grow. Weakness can be the point of transition toward excellence, and can be transformed into a strength. Who knows? Practice, practice, practice. You may make it to Carnegie Hall after all. The weakness of our strength is that we stop learning. Learning new things is always accompanied by humility because we have to admit that which we do not know. Once we stop asking questions, we stop growing. Learn something new every day, even if it is something very small. It is an essential leadership skill to recognize the gifts and skills of others. Our weaknesses can point to the necessity of delegation, and give us an opportunity to put someone else in the limelight. Watch enthusiasm grow when everyone owns credit for projects that turn out better than the plan. By sharing the successes, weakness is transformed into a strength. Newton’s Third Law of Motion demonstrates many other practical maxims and aphorisms. Do unto others as you would have them do unto you. Whatsoever a man sows, that will he also reap. Karma. It will get you every time. Whatever your understanding of this cosmological constant, we cannot defy it. We will get back exactly what we put into our business. Use it well, and it will launch your business into the stratosphere. What one thing can you do today that will provide the biggest bang for the buck? It was one of those summer days where the interstate is steaming like a hot dish just pulled from the oven. Unfortunately, we were already in an oven, and there was no place to let the dish cool down. We were on our way to Indiana to set up a large display for a client in the Pork industry. It was to be ready in two days for the arrival of the goods. Goods–as in live pigs on the show floor. These were not your standard, everyday, garden variety pig. The DNA in these animals was so valuable that they had to be destroyed after the show. It was not a possibility that they could be given away to charity. That is Some Pig. In fact, if pigs could wear lipstick? These pigs would be wearing it. Bacon is a hot commodity in the Midwest. Our client was looking forward to making some major sales. We pulled in and began to unload the crates into space 2593. That is when we noticed the pole–the kind of pole that supported the entire architecture of the hall. Now a pole may not seem like that big of a deal to you. But in the trade show world, and in the space planning documents for the show, there was no pole in space 2593. This pole was now a Big Deal. It was an obstacle to the focal point of the whole display–a big tower to which all the rest of the display attached. As it turns out, so many vendors signed up for the show that the management ran out of spaces. They decided if they could just squeeze in a few more vendors, more money could be made. Of course. And so they moved everyone a few feet to the north. Which positioned the pole right in the middle of our display. Our client had not yet arrived. The potential sales from this show warranted spending many thousands of dollars on a display. But we decided not stop to calculate exactly how much trouble we might be in. Rounded to the nearest dollar, if they were anticipating many thousands in sales? We could anticipate losing at least that same amount or more. We got to work. The show must go on. We quickly redesigned the display. We flew in parts overnight. We worked into the wee hours of the morning to make the display work in the existing space, disguising the pole as part of the plan. The pole was not our fault, but the display was our responsibility. We made it work. And it was ready for our four-legged products. Our client, though visibly pleased, had little understanding of what we had just gone through to pull it off and make it look like it was supposed to be that way in the first place. We went home with our shirts intact. Nice. I am not making this stuff up. I have more stories like this, some of which could make an entrepreneur’s hair stand on end. You cannot ask why these things happen. In small business, it just does. No matter how long you have been in business, and no matter how much passion you pour into it, Murphy’s Law prevails. At times like this, I feel as if I am being filmed for some reality TV show. They, (whoever they are), are strategically hidden with their camera on their shoulder somewhere, ready and waiting for some visible manifestation of a mental breakdown, as some strange brand of sadistic entertainment. This is paranoid thinking, I know. But these things always seem to happen when you least expect them. But let’s get this straight. In small business, some days are diamonds, and some days are rocks. Think about Murphy’s Law for a second: if anything can go wrong, it will go wrong. Perhaps this Law is not exactly a cosmological constant, but it has a striking parallel to the Law of Entropy. The Law of Entropy is a cosmological constant. The Law of Entropy states that everything in the entire Universe will go from order to disorder. Sound familiar? Indeed, it does. These natural laws in the Universe are like the law of gravity. The more you fight against them, the more they win. It is not necessary to have any background in science to identify the Law of Entropy. It is easily detected. When was the last time you owned a vehicle that maintained itself? Try placing a four-year-old child in a neatly arranged toy room and see what happens. I swear my computer operating system can go from order to disorder, just from thinking ill thoughts about the machine. The point is that no system can sustain itself without maintenance from outside that system. Now let’s get another thing straight. You will not defy the Law of Entropy. But you most certainly can thwart its effect. It is possible for the intelligent entrepreneur to anticipate and prepare for many potential problems. This is what a business plan is all about. If you do not have a plan, you will have two kinds of problems assailing your business on a daily basis. The first kind of problem is the kind one could have avoided, had you taken a moment to think about it. The second kind is all those unanticipated poles in your way. Both kinds of problems together are lethal for any business. Even if the law of Entropy is at work in your business right now, it does not have to have the last word. Most anyone can start a business. But it takes a true Entrepreneur to head off potential problems off at the pass, and create scalable systems that will keep customers coming back. Slay as many dragons as you can in advance. And join us next time for Part 3! We formed a hypothesis about the frog. We came up with earth shattering conclusions like, “most frogs are green”, and “the leg muscles are designed to jump long distances”. I am certain our teachers beamed with pride at our erudite hypothesis. But we did not understand we were using an ancient discipline. 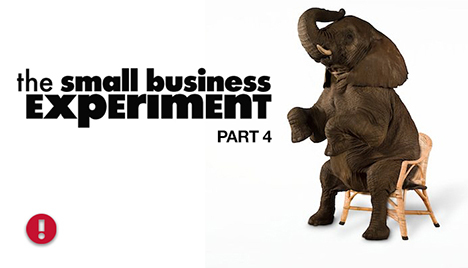 The methodology was a structured framework to produce formidable results. It was used not only by Francis Bacon, but by the likes of Galileo, Newton, and Einstein, just to name a few. And we thought we were learning about frogs. Unfortunately, we confused the slimy things with the methodology and deemed them both forgettable. Little did we know that the biggest questions in life happen outside the lab.And little did we remember that if we could think like a scientist, it would help us analyze these questions and solve the bigger problems of life. 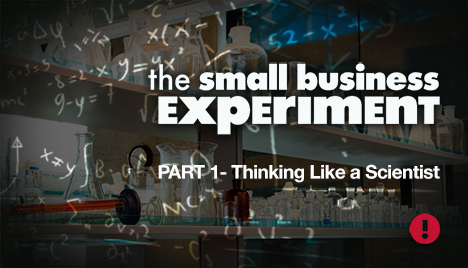 Small Business can benefit from this kind of inductive thinking.Small Business is one big giant laboratory with all sorts of experiments going on in every corner. Some of them, steaming and bubbling, are fraught with danger. (Wait, do I hear mad laughter?) If we only remembered to use the inductive method, as our 7th grade Science teacher taught us, we could avoid a few unnecessary explosions. But having some doubt does not mean that we cannot mitigate as many risks as possible using the scientific method. We can observe, we can form a hypothesis, we can collect information, we can test our assumptions. And we can allow that testing to inform our decision making. We can also weigh the possible outcomes. How do we know our customer base will love this product? What is the worst that can happen? What could we do if that happened? Is there a Plan B, or C, or G for that matter? If you have defined what success looks like, you should be able to measure it. You can test and measure the efforts as you go along. You can test the difference between efforts A and B. You can analyze the change between periods from the efforts of B. Intelligent entrepreneurs use their heads, as well as their hearts, to move their businesses forward. If you are an innovator, you will have a few explosions in your lab. 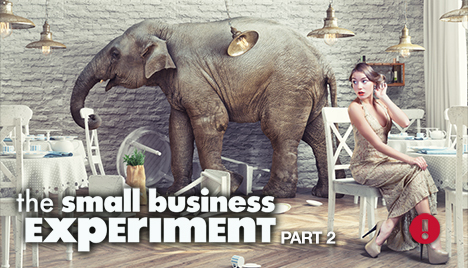 The failed experiments of small business can make you feel quite small. It is difficult to choose the right path forward when you have black around your eyes, burned eyebrows, and you feel like a fool. Knowing how to think like a scientist can make the difference between a knee-jerk reaction and a great recovery. All this month we will be talking about how we can harness the Laws of Science and the Universe to make our businesses better. While you are waiting for the rest of the posts, stir up the office a bit. Start thinking like a scientist. Don your lab coat and commence with the mad laughter. Everyone will at least be on their toes, because they will have no clue what will happen next. And join us next time for Part II. I do not think I have ever started a blog post with a Bible verse before. But do not worry. I am not going to preach at you. What I am going to suggest is that if Jesus said it, and if it is in the best-selling book on the planet, there might be something to it. I believe it applies to small business, and to the world. Letmeexplain. We have been talking all this month about the things that enable a small business to bloom and flourish. I have saved the best for last. There are at least a gazillion blog posts about the importance of creativity. What makes me think I can add anything to all the talented voices? I believe there may be one source for this precious commodity that we have overlooked. We may have overlooked it because it comes, like all good things, in a small package. And maybe we have discounted the teacher because she just happens to be the shortest teacher we have ever had. This is a recipe for something so good, that if we learn how to make it, it would be like bringing heaven to earth. Evenforyourbusiness. Bearwithme. The child entering Kindergarten this September will graduate in 2029. Few of us can imagine what the world will be like then. By 2029, the wildest predictions delivered by the most esteemed experts will slither away from sheer embarrassment. They will be wrong again. Schools today were designed to supply laborers for the industrial age. Anyone reading this post has learned to follow the rules, and to pass the standardized tests. Making a mistake was about the worst thing you can do. The ultimate goal is productivity, and adding to the GDP like good little lemmings. But what would today’s diploma mean in 2029? Enter the current age of disruption. No education can prepare you for it. We all face the disruption and even the disappearance of our jobs. Even lawyers. On May 15th, the Law firm Baker & Hostetler hired the world’s first artificial intelligence bankruptcy attorney. The robot is named Al Ross. Al does the work of 50 persons. IBM conducted a worldwide survey to ask CEO’s in 60 countries what they needed from the future labor force. The vote was unanimous. I am sure you can guess what it is. Of course. It is Creativity. Creativity is no longer an occupation. It is no longer optional. It is a fundamental skill and a way of life. You need it no matter what industry you are in, whether accounting, or medicine, or farming. We desperately need more people who can connect random bits information and combine it together in new ways. Creativity by its very nature demands mistakes. It is a series of whoops, followed by an occasional hurrah. Creativity cannot be manufactured. What we can do is create an environment where it can grow. As our age goes up, our creativity levels go down. As expertise increases, creativity decreases. Why? Becausewethinkweknow, andweshutourselvesofftonewideas. And so as we lose our serendipity, we also lose our ability to innovate. So where can we find the best education in creativity? You guessed it! A most surprising place. Not MIT. Not Stanford. But from short people. They are the resident experts. We entrepreneurs need to learn to think more like a kid. Children are the world’s greatest scientists. They challenge everything known to man and ask why, why, why until we adults are beside ourselves. It takes the questions of a child to show us how little we really know. Kids never doubt that the impossible is possible. They do not over analyze how it could be. They trust their gut intuition that it can exist. Kids cannot let prior knowledge get in the way because they do not have any. Researchers at UC Berkeley found that preschoolers were faster at figuring out electronic devices than college students. Because they did not know how the thing was supposed to work in the first place, they did not rule out any possible solution. Therefore, they found the correct answer faster than those almost four times their age. Children are completely at home with randomness and things that do not make sense. They are never sure, but it never stops them from moving forward. Children are always making things, and they are never afraid they will make something wrong. Whatever they make, they have confidence it will be wonderful. They always have a side project going. Kids are unaware of social ranking and care little for status or power. They are not worried about what anyone thinks of them. Trying to be famous is the last thing on their minds. Kids know how to play. They go outside. They run around a bit. They give their brain a break. Structure in the day is important, but so also is a deviation from structure. Many entrepreneurs have forgotten how to disconnect from the day to day pressure. Children express their emotions honestly. They know how they feel. Their heads and their hearts are connected. (Emotional intelligence, of course, comes later). It is hard for adults to know how they feel. Imagine if every entrepreneur were as observant as a child? Imagine if every entrepreneur used their full capacity to create with abandon? Imagine everyone in an atmosphere of inclusion? Imagine leaders learning to ask more questions instead of assuming we were right all the time? Imagine if we learned to trust our intuition, and were less afraid of doing it wrong? Creativity is as important as literacy, and we should treat it with the same status. How can you get more creativity in your own business? Who knew you could deal in precious commodities simply by trading recipes for mud pies in the park? Sign up for a lesson from a really short prof. 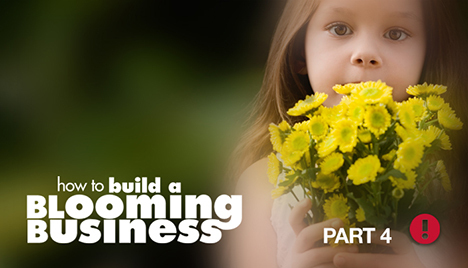 It may be just the recipe you need to get your business to bloom. I wish you many hurrahs. Why do we at etc!graphicsinc, a graphic design company, care about your business strategies? Because no matter how beautiful your graphics, they will never make more sense than the clarity of your own vision. The clearer your vision, the more lucid your marketing will be, and the better connection you will make with your target customer. We want to help you find the gold in your business. Join us all this month as we share ways to help your small business sustain and grow in a crowded marketplace. Etc!Graphics is devoted to helping you, the small business owner, think like a marketer.